It wasn’t narrow gauge, but the Suncook Valley Railroad was fascinating nonetheless. Once a branch of the Boston & Maine, this quirky little short line ran from Concord, New Hampshire, across the Merrimac River, up a steep embankment with a switchback, and along the Suncook River to Center Barnstead. 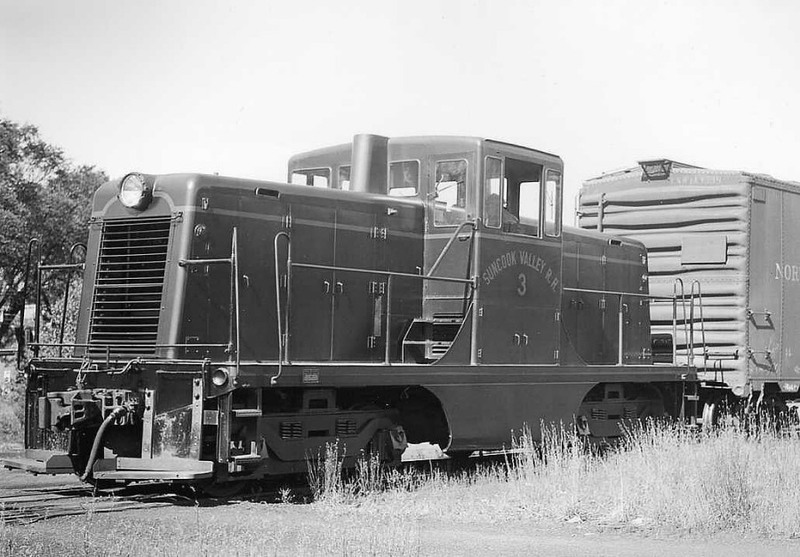 It had three engines over the years, a small Baldwin Mogul, a used GE 43-ton Diesel, and a brand new GE Phase IV 44-tonner. 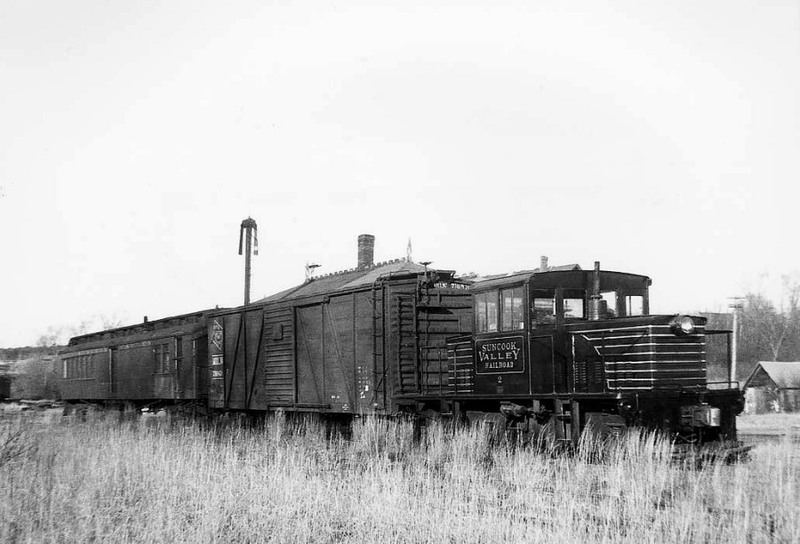 It had three passenger cars, two boxcars and three snowplows – not much else. Here are my drawings in progress and some photos from my personal collection. Left click on the drawings and photos to enlarge them. The SVRR Mogul was a stock model built in 1927. 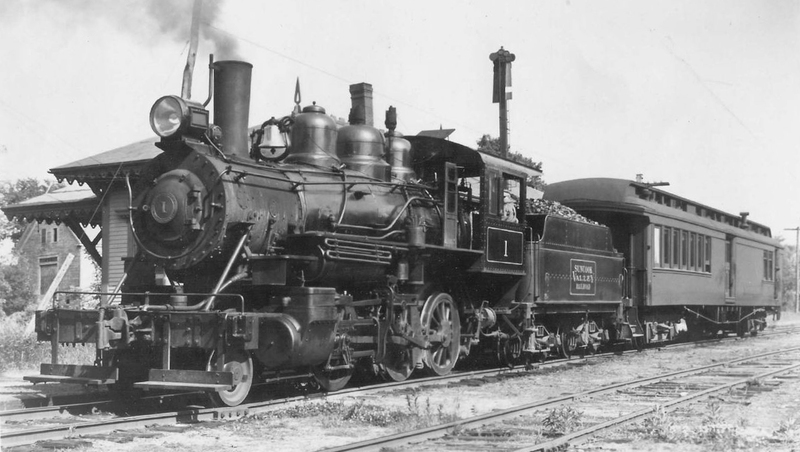 Similar locomotives could be found on many short lines and lumber railroads of that era. 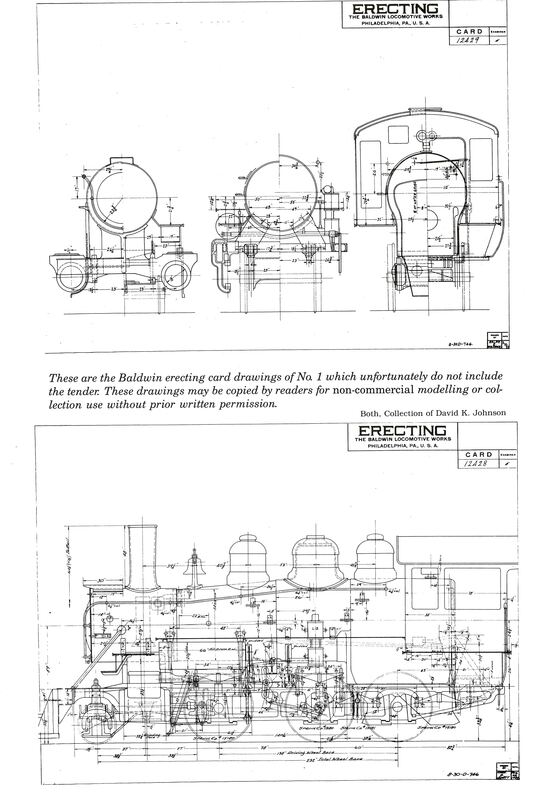 A copy of the Baldwin erecting card for this engine was published in the book The Blueberry Express but the tender was not included, so I am working on a drawing. Here is the GE 44-ton No. 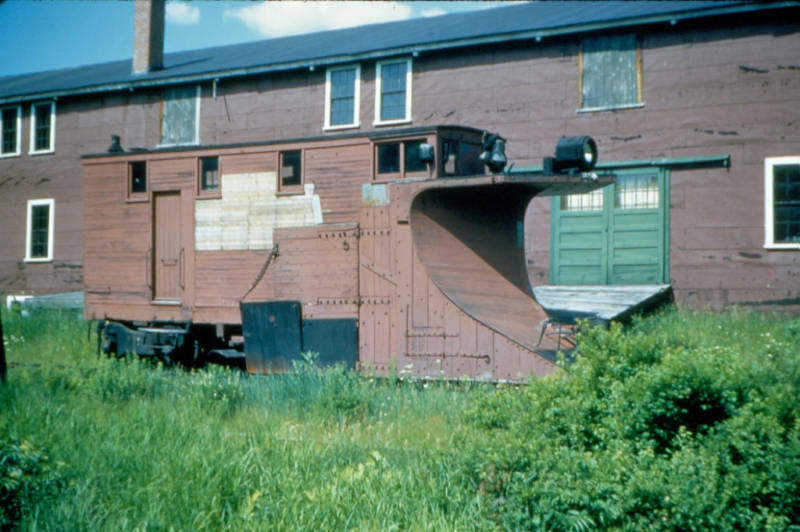 3, which went to the Sanford & Eastern Railroad in Sanford, Maine, after the SVRR shut down in 1952. 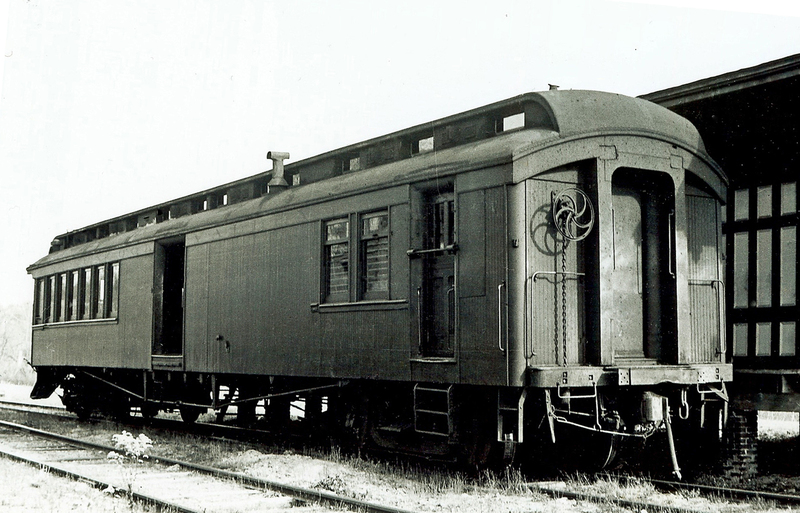 For most of this railroad’s life it ran a single passenger car, which was converted to an RPO/Baggage/Coach from B&M RPO/Baggage car No. 1982. Here is a photo and my drawing in progress. And yes, there were three windows in the RPO compartment on the other side. The open platform end was reinforced with four vertical rails. Of the three snowplows, No. 500 is my favorite. This was an 1898 relic from the B&M that lasted until 1945. I’ve collected more than a dozen good photos of this plow, showing both sides. I even have a couple taken after the plow blade was removed, showing detail that is hidden in other photos. Despite all this information, I couldn’t get a good handle on the dimensions. I drew it at both 30 and 36 feet length, with trucks ranging from 4′ to 5′-6″ wheelbase. Three years later I was sorting though old papers, including the drawings and photos of this car, and it became instantly apparent that – as often happens – I had the answer but was too close to see it. It looks like this car was 30′ long with 5′ trucks. I’ll make a new drawing soon. 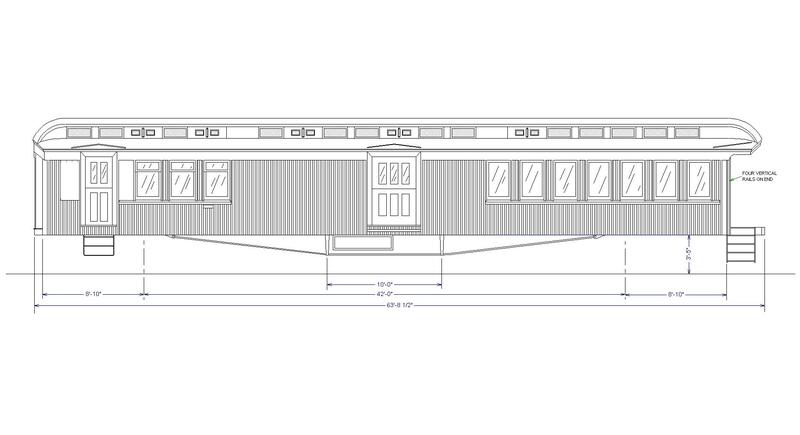 My intent is to model all of the SVRR rolling stock in 1:64 scale. I had a River Raisin brass model of a Phase III GE 44-tonner in black primer that needed modification of the hood vents and Chinese Red paint to be SV Phase IV No.3. More recently I bought a Phase IV model from Smokey Mountain Model Works that saved me from having to modify the RRM model, which I have since sold. I also bought a B.T.S. kit for East Broad Top 0-6-0 No. 6, which has the proper drivers, tender trucks and other parts for SV Baldwin No. 1, thinking I would stretch the frame a foot between the first and second drive wheels, and make a new boiler, cab and tender tank. I have decided instead to build this model as a more generic 2-6-0 and someday scratch build a model of the SV engine. I lifted this photo from the B.T.S. website. The combine and plow 500 will be a lot easier, modeled in styrene. I have brass trucks with the proper eight foot wheelbase for the combine and 5′ archbars for the plow. I also have four beautiful brass castings that were made by North Yard in New Zealand for the 20″ barrel style headlights used on the engine and plows . 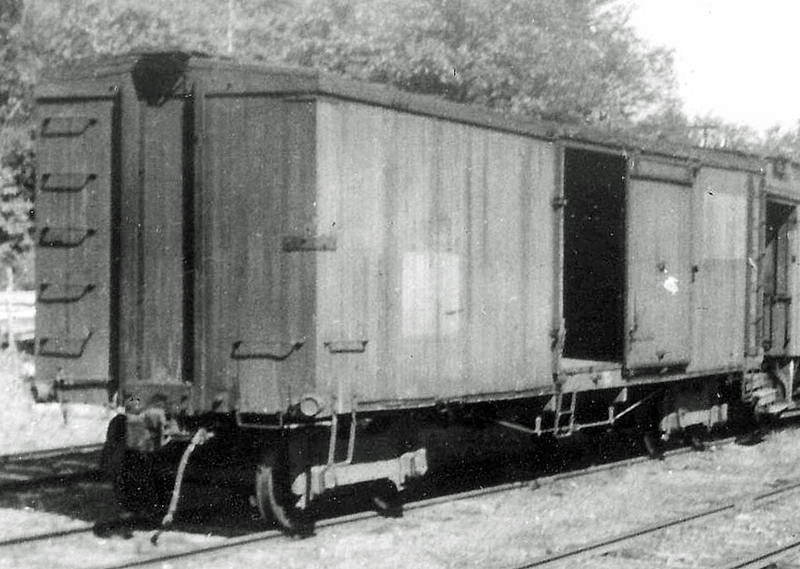 The boxcars were simple double-sheathed units salvaged from the B&M. No. 100 was B&M No. 48074 and No. 101 was B&M No. 61075. No. 101 was modified for milk service. 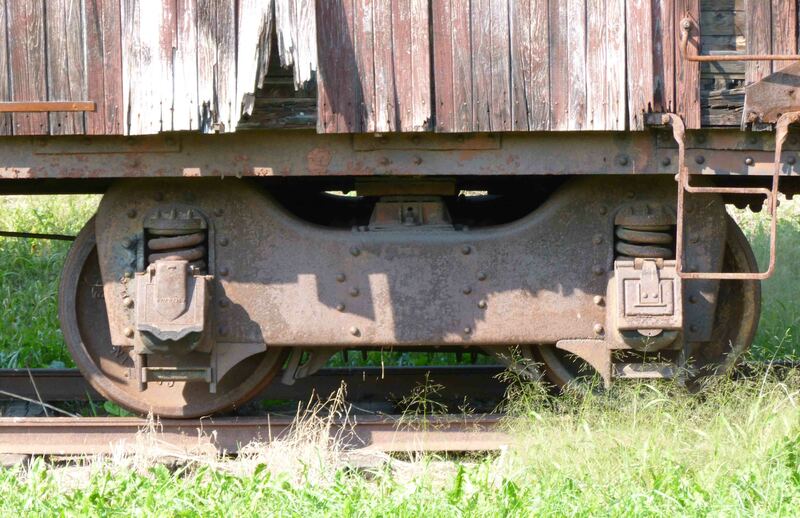 They never left the railroad, so kept their stamped steel Fox trucks to the very end. Earl Tuson sent me a photo from his collection taken by Breed Walker in 1932 from which I cropped this photo of Boxcar 101. According to Earl the vertical Z-bars on the end are part of a Mogul brand kit that the B&M installed on many of its wooden boxcars to reinforce the ends. Boxcar 100 had steel ends, which Earl informs me were reverse Murphy corrugations. A third ex-B&M boxcar like the two on the SVRR sat next to the hardware store in Pittsfield and still exists. Here is a shot of one of its Fox trucks that I took in September 2012. 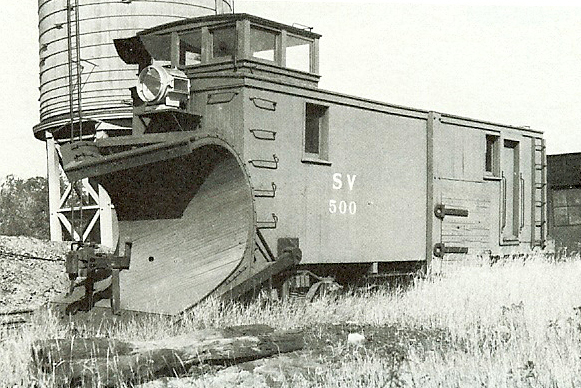 This is a photo of another SVRR plow, No. 502. Again, an ex-B&M car (No. W3667). This style was common in New England until the mid-twentieth century. Note that this one also had Fox trucks. And here is the GE 43-ton No. 2 that didn’t last long, as it was too weak to haul freight up the steep switchback from the Merrimack River. Finally, here is a photo from The Blueberry Express of a neat little building that I want to include on my layout. 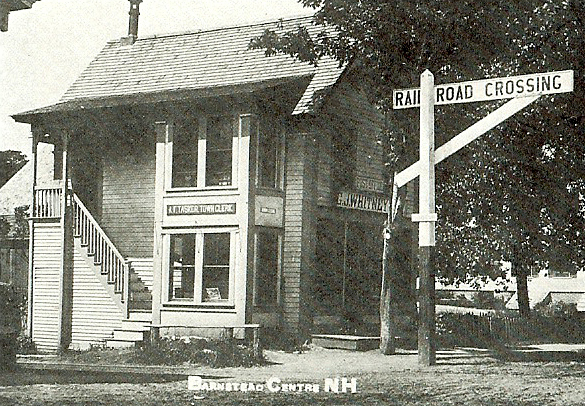 It sat next to the SVRR tracks in Center Barnstead and housed the post office and town clerk’s office. I probably saw it on my way to Parker Mountain Boy Scout Camp in the early 1950s but don’t remember it. Text, photos, and drawings on this page Copyright 2010-2013 by Wesley Ewell and may not be used in any form without permission. An exception is granted for modelbuilders who may copy the drawings for personal use, but may not sell, distribute or publish them in any way. Dwight Smith sent me a post offering a CD of 35 photos of the SVRR that he took in the early 1950s for $25 + $2 postage. Here are thumbnails of his photos. I bought his CD and am very pleased with the quality and variety of photos, some of which show details of Combine 3 that I have not found in other pics. I highly recommend sending Dwight a check. 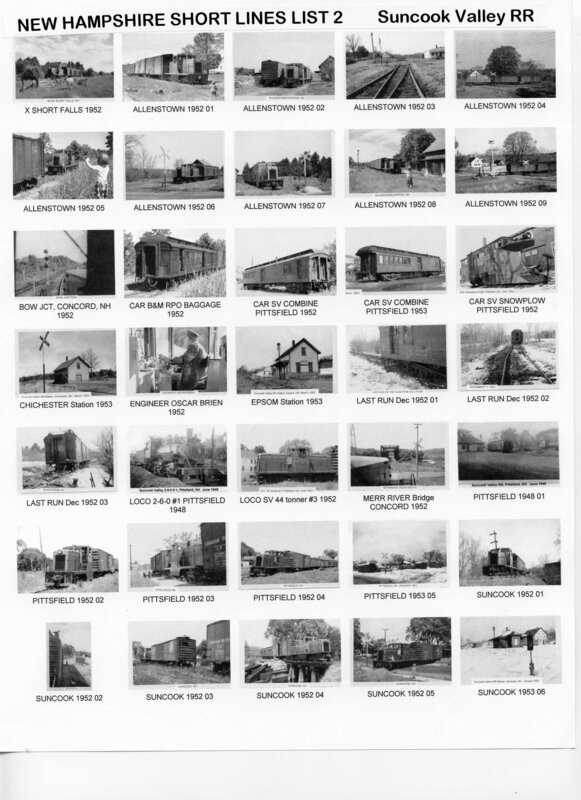 Dwight says he has nearly 1600 photos of NH and VT railroads. What does the right hand sign in the last photo read? It looks like G.J. Whitney, maybe a very distant relative of Scott Whitney, and likely proprietor of whatever business occupied the first floor. Great website! Where is the old boxcar in Pittsfield? Next to what hardware store? My job takes me around NH and southern ME and I’m always on the lookout for old RR stuff. It is now located in Barnet, Vermont. You can see it with a lot of other derelict equipment from Route 5, near the intersection with I-91. I just got a 1960 New Hampshire Profile magazine that has a story about the Suncook line and the last gm who closed it down. Interesting read. I just came across a RR ticket that includes a baggage ticket for Suncook Valley RR to Concord part- the ticket is three parts; I would like to figure out the time period for it and could use some help- can I post you a picture/scan of it? I live in Concord. Just discovered your informative website, and was particularly interested in your notes regarding Baldwin #1, as I’ve long contemplated modeling it. I’m curious, did you ever finish the drawing of its tender? Unfortunately, I have done very little drawing or modelling for nearly four years. Several consulting opportunities – including one in the Virgin Islands – came along, so I failed retirement once again. Then I sold my house and bought a condo that needed a complete cosmetic rehab. Am hoping to get back to the drawing board this winter. So no, I never did draw the tender.